Ten years ago today — May 9, 2003 — Japan launched a daring asteroid sample-return mission from the Uchinoura Space Center, atop an M-5 rocket. Originally called Muses-C, Hayabusa (“Falcon”) was a difficult mission to begin with, but experienced a series of setbacks that made its ultimate success all the more impressive. In late 2003, a large solar flare degraded the spacecraft’s solar panels, reducing the power available to its ion engines. The original rendezvous date in early summer 2005 was pushed back to September. On July 31, 2004, Hayabusa’s X-axis reaction wheel failed. The spacecraft successfully rendezvoused with 25143 Itokawa (1998 SF36) — an asteroid about as big as three football stadiums at 550 x 180 meters (1800 x 590 feet) — on September 12, 2005. 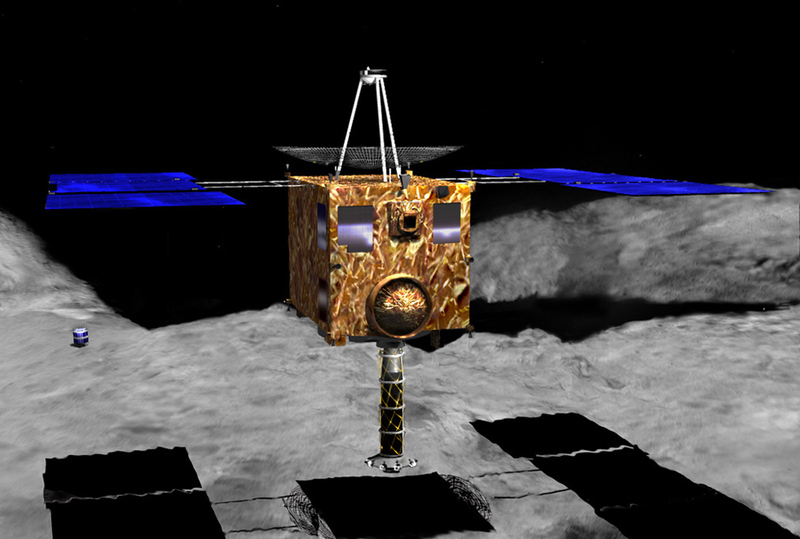 Hayabusa established itself in a heliocentric orbit for station-keeping about 20 km (12.4 mi) from the asteroid. A week later, on November 19, Hayabusa again descended toward the asteroid, and released a “target marker” before contact was lost as it fell to the surface. Later telemetry indicated that Hayabusa hit the surface at 20:40 UT 19 November (5:40 a.m. JST 20 November) at roughly 10 cm/sec and bounced. It bounced again at 21:10 and then landed at 21:30 within about 30 meters of the target marker. At 21:58 (6:58 a.m. JST 20 November) it was commanded to make an emergency ascent. The craft remained on the surface for about half an hour but did not collect a sample. This was the first ever controlled landing on an asteroid and first ascent from any other solar system body except the Moon. On November 25, Hayabusa touched down again, and fired two “sampling bullets” at the surface. Telemetry could not verify that they actually fired; nevertheless, Hayabusa lifted off. Controllers restored communication in March 2006, and learned over the next several months that the spacecraft’s status was somewhat grim: low on fuel, two out of three reaction wheels inoperative, plus 4 out of 11 batteries had also stopped working. The spacecraft’s degraded solar cells and batteries were still sufficient to maintain thrust and attitude control with its xenon ion engine, and in April 2007 it started its journey Earth-ward. When Hayabusa was a little outside the Moon’s orbit, it released its sample return capsule, which de-orbited on June 13, 2010 and landed near Woomera, Australia. Subsequent examination of the sample return capsule showed that there were roughly 1500 dust particles, presumably from asteroid Itokawa. You can learn more about this remarkable mission at this Japan Aerospace Exploration Agency (JAXA) page. Five years ago today — September 27, 2007 — a Delta-II launch vehicle carried the Dawn spacecraft to space from Cape Canaveral, sending it on a roundabout journey to the asteroid belt. 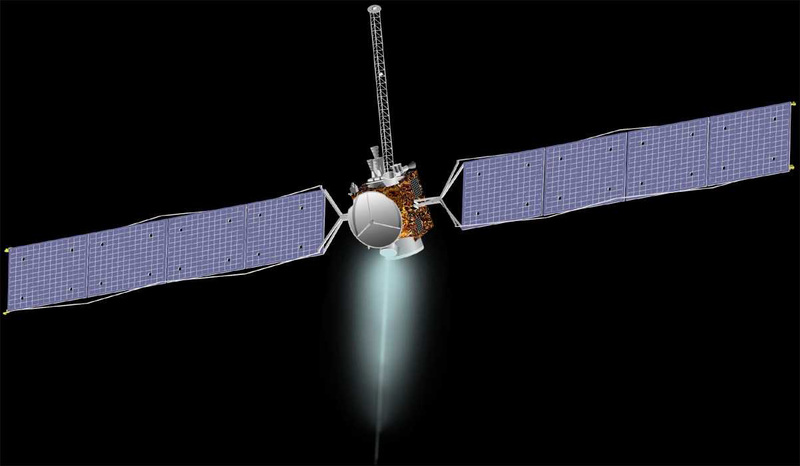 After a gravity-boost flyby of Mars in February 2009, Dawn reached its first asteroid target, 4 Vesta, and entered orbit around it in August 2011. There it began its mission to “characterize the asteroids’ internal structure, density, shape, size, composition and mass and to return data on surface morphology, cratering, and magnetism.” Dawn’s measurements and subsequent analysis should help scientists understand better the conditions in the early solar system. On the main mission page, you can read about one of Dawn’s most exciting discoveries: hydrated minerals on the surface of 4 Vesta. While not as potentially useful as discovering actual water, it did provide evidence that Vesta once held water, but it long since boiled away. 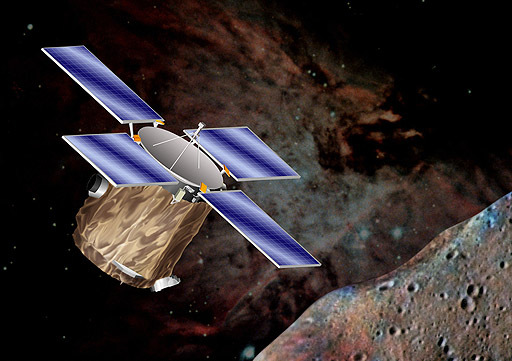 Dawn left Vesta’s orbit this past September 5th, and is scheduled to rendezvous with 1 Ceres in February 2015. It will study that asteroid until the end of its mission, currently set for July 2015. 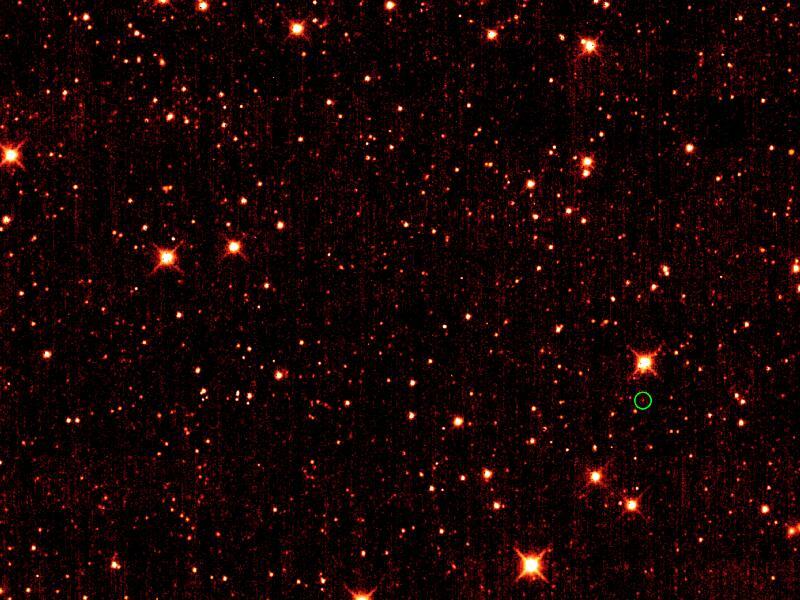 Comments Off on A New Target for Asteroid Exploration? Fifteen years ago today — February 17, 1996 — the Near Earth Asteroid Rendezvous (NEAR) spacecraft launched on a Delta-II rocket out of Cape Canaveral. The spacecraft was renamed NEAR-Shoemaker in honor of astronomer Gene Shoemaker, and was sent on its way to the asteroid Eros. NEAR-Shoemaker flew by the asteroid 253 Mathilde on June 27, 1997, made a gravity-assist maneuver around Earth on January 23, 1998, flew by Eros on 23 December 1998, and finally entered into a tight orbit around Eros on (appropriately enough) Valentine’s Day 2000. As we noted a few days ago, after a year of observations NEAR-Shoemaker landed on Eros on February 12, 2001.